← Storytelling for Pain Relief???? The annual collaboration between the storytellers at the School of Information and Library Science and the UNC Morehead Planetarium has taken a “giant step” forward. Past attendance at the event has hovered around 85 people for the past several years, but this year we shattered that number with over 218 in attendance and more than 40 turned away at the door for fire safety reasons. This event seems to have finally gained the traction we have been hoping for, whether due to extensive publicity, marvelous storytellers, or social media engagement, we are not sure, but we reveled in a capacity crowd for the first time, and we are now wondering whether next year will involve two shows instead of just one. We’ll await the planning meetings for next year. 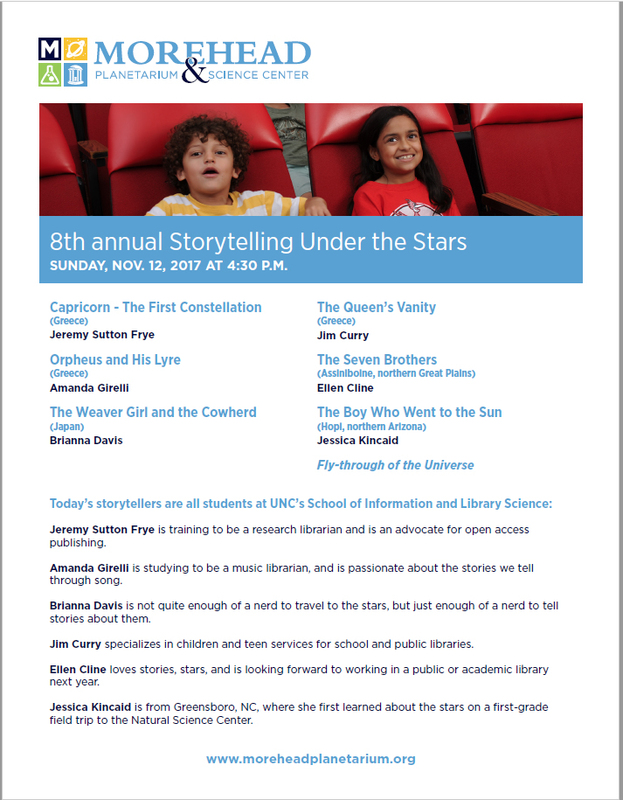 This year we had six storytellers from the INLS 558: Principles and Techniques of Storytelling class. Jeremy Frye told the Greek story of the fall of the titans as Zeus overthrows Cronos, and the first constellation of the She-Goat Capricorn in commemoration of her nursing Zeus as an infant. Amanda Girelli kept the Greek theme going with the beautiful story of Orpheus using his lyre to appeal to Hades for the return of his beloved Eurydice, and the ensuing sadness when he looks back too soon and loses his love (the constellation Lyra represents his musical instrument). Brianna Davis, then told a Japanese story of the Weaver Girl and the Cowherd, who fall in love and neglect their heavenly duties, inciting the Lord of Heaven to destroy the celestial bridge that connects the two lovers on either side of the heavenly river (Milky Way). Once each year, he forms a bridge of birds so they can be reunited. Jim Curry continued the Greek theme with the story of the Queen’s Vanity, a story that explains many of the fall constellations (Cassiopeia, Perseus, Cepheus, Cetus, and Andromeda); the story, briefly, is that Cassiopeia bragged she was more beautiful than the gods, who punished her by demanding she sacrifice her daughter, Andromeda, to the sea monster Cetus. Perseus saves her with the head of the gorgon, Medusa, turning Cetus to stone. The gods them place Cassiopeia in the heavens but in a throne that circles the north star, so she is sometimes upside down in a most undignified position. Ellen Cline then told a Native American (Assiniboine) story about the seven brothers who want to remain together always, and who choose to be stars. Jessica Kincaid finished the evening with a Hopi tale about the Boy Who Went to the Sun to find out who his father was, creating a path (Milky Way) of cornmeal and seashells to get there. The Sun says the boy needs to learn more and sends him back to earth, where he pays attention to everything and learns patience. On his next visit (traveling partway by comet), his father, the Sun, welcomes him. Thanks to Amy Sayle, educator at the Morehead Planetarium, for coordinating and championing the event, and to all the staff at the planetarium who made it such a rousing success. We look forward to next year and continuing this marvelous community tradition.